"Rajah of Kuttipuram, Malabar, India. Owner of the Kandappenkundu lands. His heralds and bodyguard. Attendants: Brahmins and Nayers, who in the presence of the Rajah put their hands over their mouths. Shield- and sword bearer." 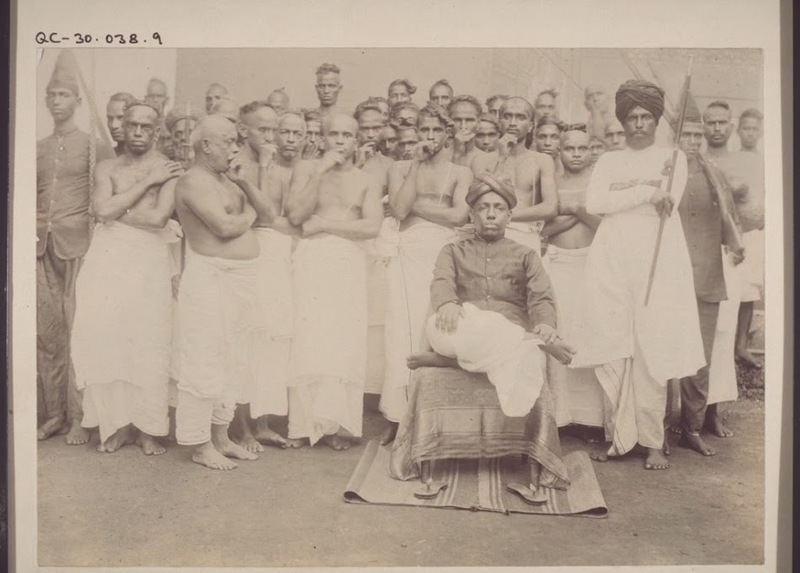 [English: Rajah of Kuttipuram, Malabar, India. Owner of the Kandappenkundu lands. His heralds and bodyguard. Attendants: Brahmins and Nayers, who in the presence of the Rajah put their hands over their mouths. Shield- and sword bearer.]" "[original caption] Rajah von Kuttipuram, Malabar, Indien. Eigentümer des Kandappenkundu Landes. Herold-Leibgardisten. Hofstaat: Brahminen u. Najers, legen in Gegenwart des R. d. Hand a. d. Mund. Schild-und Schwertträger." Title: "Rajah of Kuttipuram, Malabar, India. Owner of the Kandappenkundu lands. His heralds and bodyguard. Attendants: Brahmins and Nayers, who in the presence of the Rajah put their hands over their mouths. Shield- and sword bearer." unknown studio , “Rajah of Kuttipuram, Malabar, India. Owner of the Kandappenkundu lands. His heralds and bodyguard. Attendants: Brahmins and Nayers, who in the presence of the Rajah put their hands over their mouths. Shield- and sword bearer.,” BMArchives, accessed April 23, 2019, http://www.bmarchives.org/items/show/67617.